It's the Napoleanic War - with dragons. This is a brilliant, well-written series that is often funny. Peter Jackson optioned the film rights (then became a little busy). Personally, I read it over and over. The hero, Captain Laurence, is a navy man ruled by his sense of honour. When his ship captures a French frigate, they find an unexpected treasure: a dragon egg. Dragons are crucial in the war, so it is great news – although it is an unknown breed. There’s one major problem: to be of any use, dragons must be put into harness by their nominated captain moments after leaving the egg – and this one is ready to hatch. Someone on board must leave the navy, harness the dragon, and thus become one of the infamously less-respected Arial Corps. The bad luck falls on Laurence, who swallows his horror and accepts a dragon he doesn’t really know how to deal with. But the dragon needs him – and his love. A very special relationship develops between man and dragon. 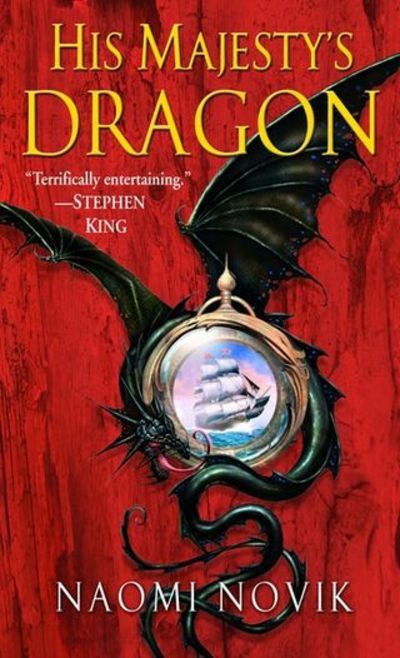 Laurence is very intelligent, but it is clear early on that Temeraire (the dragon) is far smarter – including the usual intellect’s attitude to notions of honour (“But what is it for?”) It is a little like a father-son relationship, except that Temeraire swiftly also becomes Laurence’s closest friend. Laurence loses his ship and a great deal of his respectability. He is initially hated by the Arial Cops, the majority of whom have been waiting and hoping for a dragon of their own since they were a child. And then there’s Bonaparte to contend with. . . Rating: PG some battle violence (the battle scenes are great). The deck of the French ship was slippery with blood, heaving in the choppy sea; a stroke might as easily bring down the man making it as the intended target. Laurence did not have time in the heat of battle to be surprised at the degree of resistance, but even through the numbing haze of battle fever and the confusion of swords and pistol-smoke, he marked the extreme look of anguish on the French captain’s face as the man shouted encouragement to his men. It's wonderful! She's writing the final book right now. This series sounds like a hoot!